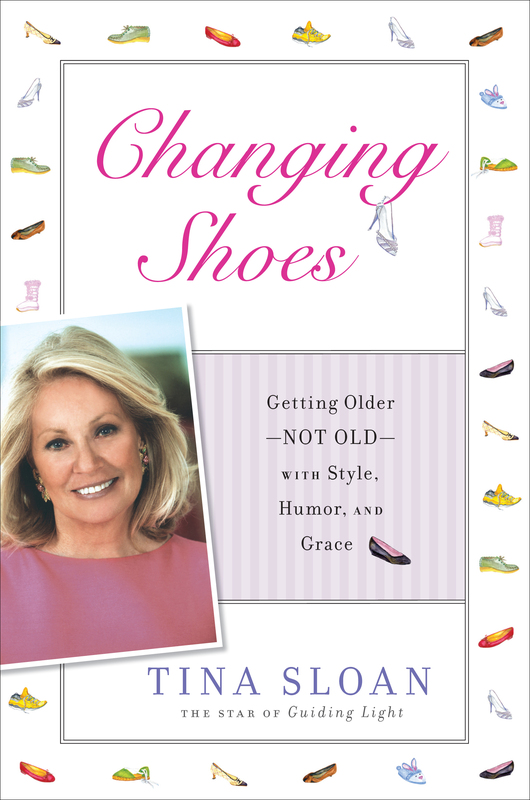 Welcome to NABBW member and actress Tina Sloan, whose first book, “Changing Shoes: Getting Older – NOT OLD – with Style, Humor and Grace,” has just been published by Gotham Books. September is a big month for Tina, as her play, “Changing Shoes,” opened on the 20th. We caught up with her recently to ask her our favorite 20 questions. This is going to be very straightforward – I have been married for the past 35 years to Steve McPherson and we have a son Renny who after Harvard went into the U.S.Marines and on to Iraq. He is now at Harvard Business School and I am sleeping at night again. I have been an actress on Guiding Light, a soap opera, for the past 26 years until it went off the air in Sept 09. Prior to that I have done other soaps, many, many commercials and quite a few films with Woody Allen, Al Pacino and so on. Recently I have done several movies, webseries, and written a book called CHANGING SHOES and a play of the same name, which is the book on its feet. The book came out on Sept 16th and the play opens to a sold out audience in New York on Sept 20th so I have been reinventing myself as a playwright, author, stage actress and quite busy as my husband will attest. I once was very athletic- climbing mountains, running marathons but now take nice walks and do yoga. So my self is aging and I am doing my best to stay in the game by reinvention. 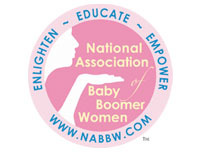 My parents died several years ago but I was the caregiver for the last years of their lives. My one son is 31 and my husband has recently moved his office into our den! Somehow this is quite delightful though I was full of trepidation before he moved. This summer our son who was between first and second years of Harvard Business School did a startup in our dining room, so we were all working in our New York City apartment and we —really had fun. Amazing!! I had a very free childhood. I would go out to play and come back for dinner and was able to learn independence and learn to use my imagination. We would decorate wagons (little ones) with crepe paper and flowers and pull one another in them, we would read a lot and loll about talking and playing games and just exploring the wide, wide world with no fear. We would make up plays and perform them for our parents –I am still making them up and performing in plays! Loyalty, independence, speaking the truth, taking action rather than letting others do it. Bridget Jones Diary. Bridget keep bouncing back no matter what happens and she believes so naively that it all will turn out perfectly and then is disappointed again but keeps coming back into the ring. And like me she LOVES to eat. Love to travel with my son even if it is just down to the corner for lunch and for a walk in the Park. Everything and then again Nothing! As an actress my looks are my job but I won’t have plastic surgery or use Botox as that will keep me from showing emotion. 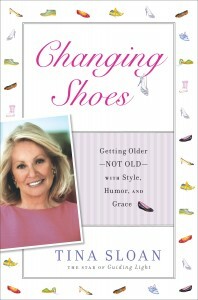 I also am really scared of going under the knife, so I use makeup for aging faces and never go out without it – once I did and bumped into THE ONE WHO GOT AWAY…..
Gone from being a soap opera star for 35 years to writing a book CHANGING SHOES and writing a play also called CHANGING SHOES and performing the play all over the US (NY, Pittsburgh, Cincinnati, Houston this Fall). I wrote both of these to inspire women to get unstuck as they age and the letters and emails I have gotten show me this is really working, that I have touched that place of “learning to take ones power back” and learning to twinkle again. 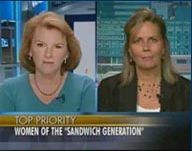 I hope to have a way of stating simply and conversationally all of the thoughts, hurdles, ideas, qualms, fears and joy that we women of a certain age have constantly, whether we wish to think about all of it or not. No, but one never knows what is out there in life. My current “plan” is to keep on working. Oh I can and here it is right out of my book….it is perfect answer to that moment in time that changed me. It was at age 48 that I was struck by the proverbial clap of thunder, the kind that forces you to do a bald-faced re-evaluation of your life. It was ten in the morning and I was walking down 44th street in Manhattan with my soap opera daughter, Beth Chamberlin to get a cup of coffee. We were in evening gowns because our last scene had been a gala party where we were murdering someone. (Most likely the someone we were murdering was asking for too much money in his contract.) “Oh Beth you were so great in that scene! The way you stabbed him thirty two times, I loved it. Thank heavens you didn’t get any blood on my gown!” I said laughing. I was feeling fabulous and beautiful, wearing dripping diamond earrings, Christian Louboutin heels, and an Oscar de la Renta canary yellow gown. I loved to be spotted outside in my costume, as though my character had suddenly broken through the fourth wall and come to life. Beth and I would waltz outside after our scenes in whatever garb we were wearing, be it bloody medical scrubs, pajamas or elegant designer gowns, and run and get some fresh air. Even in a city like New York, where people have seen it all, our appearance on the street always drew a lot of attention. As a woman and an actress no less, I know when I’m being watched. I would feel the covert glances of strangers assessing me, and let’s admit it, for any woman, this can be a thrill. But this time, standing there in the coffee shop waiting for my double tall mochaccino to be delivered, I could sense that something was wrong. Looking around the coffee shop, nothing seemed to be out of place… sugars, creamers, straws, napkins—everything was where it was supposed to be…what could be wrong? Then I saw him. The man with the salt and pepper hair in the corner of the coffee shop, perfectly dressed in an Armani blue blazer, yellow Hermes tie and gold cuff links staring fixedly at Beth. I followed the trajectory of his eyes and there could be no doubt, he was staring at her, the way men used to stare at me. If he had been pointing a pistol at me it would not have been as terrifying. Glancing around, I understood what was making me feel uneasy. They were ALL looking at Beth. The handsome man in the corner, the man making our coffee who was so transfixed he scalded himself with the hot milk, the three girls in line behind us with their yoga mats, even the little red haired boy and his two friends—obviously playing hooky—were watching her. The whole coffee shop was enthralled with Beth. Nobody even glanced at me. After getting back to my dressing room, I looked in the mirror and was astounded. How—in one day—had I gotten old? And more importantly, how had I not noticed the wrinkles and soft arms? I am accomplishing my dreams just by writing this to you as it will spread the word that there are answers. I want people to know that they’re not alone in these midlife experiences. I felt alone for a long time and if I can inspire someone to approach their life differently, to start seeing the possibilities again, then I’ve done my job and accomplished my dream. I certainly want my book to inspire women to come alive again, to reengage and that is so important to me. The play will do the same as it is the book on its feet. It is time to change shoes and get into the game and not let the media take it away as they will try to. This will hopefully make a difference in my world, the world of middle aged wonderful fabulous and glamorous women. My aunt Ano who was fiercely independent and honest and well dressed and who never complained and who above all was great great FUN.